The Marvel Cinematic Universe has past its ultimate performance with Avengers in 2012, and Phase Two began this year with the incredibly disappointing Iron Man 3. I'm not gonna dress it up: superhero movies are slowly getting dumber. The Marvel films are developing an intertwining plot in this expansive universe that doesn't quite get the attention it deserves, turning it into a convoluted mess with more holes than swiss cheese. And this, my friends, is exactly where Thor: The Dark World begins to slip up. 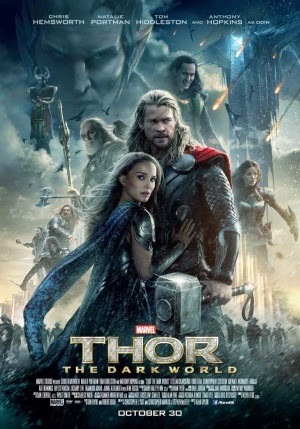 A year after the events of Avengers, Thor (Chris Hemsworth) continues to protect Asgard and the Nine Realms from evil alongside his father Odin (Anthony Hopkins) and the Warriors Three; but even they struggle to keep the peace when Malekith (Christopher Eccleston) of the Dark Elves casts a reign of terror over the Nine Realms using a mysterious magic, with his ultimate goal being to claim the universe as his own. Facing a new peril, Thor must unite with Jane Foster (Natalie Portman) and counter the threat before it's too late. There is nothing wrong with a film that embraces its lack of complexity, as proven with Avengers which was hardly the most substantial film of the year. But Thor: The Dark World can seldom match this appeal of brainless action fun, for its plot is thin as paper, its characters as two dimensional as an 8 bit video game and its pacing a complete mess. Rarely does the film embrace its characters or develop its aesthetically badass villain who, despite being portrayed brilliantly by Eccleston, lacks any depth whatsoever; his character can be summed up as a simple evil guy who wants to destroy the world with evil death stuff. Nothing more. The Dark World boasts a script full of superb jokes - most of which are completely misplaced. There are many scenes that demand a powerful emotional response, but they are simply denied it in favour of endless gags hurled at the audience at a ridiculous pace. Even during heavy climactic battles, or during important character arcs, there is always an overdose of badly timed comedy. Examples include Stellan Skarsgård's characters sudden obsession with not wearing clothes, or perhaps Darcy's inability to remain quiet for at least five seconds. What happened here? Loki's character throughout the film also leans towards his fangirl appeal. His threatening villainy from Thor is long gone, and he has become naught but a comedic sidekick with some evil intentions and endless one liners. Thor: The Dark World boasts some excellent performances (especially Hemsworth) and thrilling set pieces, but little else. The story, the characters and the pacing all feel completely unfinished, and the end result is a new low for the Marvel Cinematic Universe.